Are you planning a trip to France? 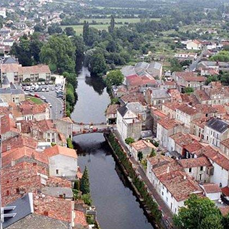 Please consider visiting Fontenay-le-Comte! Whether you are alone, with your family or a group, you are a welcome visitor! Fontenay-le-Comte is a charming town located in the Vendée department (county in USA) in the Pays de la Loire region of France. It is about four hours southwest of Paris, one and one-half hour west of Poitiers, two and one-half hours north of Bordeaux, and about one hour east of the English Channel. When looking it up, be very specific on the name as five towns start with “Fontenay” in France. Palatine became Sister Cities with Fontenay-le-Comte in 1995. Since then, members of both Palatine and Fontenay Sister Cities Associations have enjoyed staying in each other’s homes and partaking in multiple exchanges. In 2016, Fontenay will be holding its 67th biannual celebration “la Biennale”, a festival of multi-cultural music, dance, and parades of colorful and elaborate floats. Are you ready to visit? We will do our best to coordinate everything from lodging with one of our French Sister City’s families to a personal guided tour of Fontenay and beautiful sites of YOUR choosing—gardens, historic places, natural parks, art, architecture. Flying into Paris is the most direct way from Chicago O’Hare. However, be warned that French unions often stage one-day strikes affecting flights, trains, and taxi service. Your airline should notify you but scheduled strike notices are posted on the Charles De Gaulle Airport website www.aeroportsdeparis.fr. The airport website has very useful information as to where to shop, eat, rent a car, or catch a train. If you are taking the train directly to Fontenay, you will use the TGV high-speed train. Buying your tickets in advance is strongly suggested since reservations are usually necessary. www.raileurope.com will give you the schedules, ticket prices, and all the information you will need. You will need to transfer at Poitiers to Niort which has the closest train station to Fontenay. Renting a car in Poitiers is a great option. Poitiers has at least three car rentals: Avis, Enterprise, and Europcar. All are within walking distance of the train station. Check Google Maps for the exact location of the rental company you choose. Before leaving, make sure you know what kind of gas your car needs. All cars start out with a full tank. You will pay extra for an automatic transmission. If your car comes with a GPS, have the rental car agent help you set the language to English and any other helpful hints. Toll roads are just as common in France as in Illinois. Most accept VISA, but the toll roads have local ownership with their own VISA requirements. Be prepared to have to pay with euros at some booths that do not accept American VISA cards. Obey the speed limits because there are speed cameras that will send you your speeding ticket several months later. While the mailed ticket is in French, the website for paying the fine is in English, fair and easy to use. All toll roads have gas stations and places to eat. Signage is just before the exit, so being prepared to turn quickly helps. Food can be very local or a chain just like in the States. Bathrooms usually have toilet paper, but some along the road don’t – carrying your own is helpful. Also, bathrooms are sometimes shared by both sexes. Using a GPS is a great way to get around, but it is not always accurate as GPS maps are not as frequently updated. If you have activated your smart phone, it should have the best directions. Best Western Hotels in France are simply marvelous. They can be city manors or country chateaux. There are older hotels with charm as well such the Best Western central hotel in Poitiers and the Manoir de Beauvoir just outside Poitiers where you dine on their veranda overlooking a pond. Most are air-conditioned, but read carefully as some hotels mean their lobbies are air-conditioned, not the guest rooms. Others have air-conditioned guest rooms at an extra cost. Fans are usually complimentary. Members of Fontenay Sister Cities Association welcome Palatine Sister Cities’ members to stay with them. It is a great way to see how our French counterparts live. Please be respectful, water restrictions are much like those in our southwest. Air conditioning is an open window. Window screens are not generally used in France. Whenever the weather permits, lunch and dinner are usually outside and leisurely. Make sure you notify all debit and credit card companies of the cards you are taking and that you will be out of the country. They will want to know the dates and countries you will be traveling in or through. It is advisable to always add several dates after your anticipated return so to allow for any unforeseen delays. You’ll need to take with you the 800 number to make any changes and “Lost” card number with you. Make two copies on one double-sided sheet of paper of your passport, health insurance cards, and credit cards. Keep one copy with you at all times and leave one copy with your emergency contact person back in the States. Smart phones have the ability to know where you are without using an European SIM card. Using the smart phone as a camera will automatically record the date, time and location of each photo. That will save you from worrying about the correct spelling of the place, which place or when you were there. Please be aware that when connected to the Internet at your hotel, you may receive texts or emails at the same cost as you do in the States. There are companies that will send you a cell phone with a SIM card specific to the countries you will be traveling to. Some travel guides suggest buying a SIM card in Europe. While they are cheaper, most demand an actual address in the city where you are buying the card in. Sometimes the salesperson will use his address, but obviously won’t share that information with you, which may present a problem in the future. If you activate your phone, make sure you know all the charges and usage.